June 21, 2014 – Burr Ridge, IL -- Dream Street Stallions debuted at its first show in the mid-west, "Dressage at Waterloo" in Grass Lakes, MI last week with their signature quality results. Adult Amateur Dawn M. Bernardo contested the Open Prix St. George under FEI judge Liselotte Fore, winning the class with 70.132% on the impressive stallion, Rubinero. The following day, Rubinero contested the Open Intermediate I under "S" judge Cindy Canace, again winning with a 70.395%. 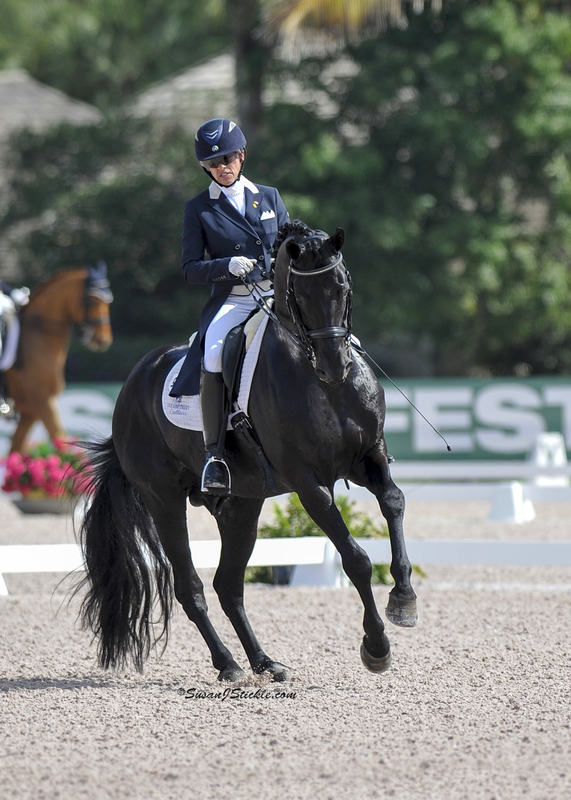 Bernardo and Rubinero are qualified and will compete at Dressage at Devon CDI**** this fall. Bernardo trains with USDF Gold Medalist Rick Rockefeller-Silvia at Dream Street Stallions in Burr Ridge, IL at Legacy USA, a lovely 40-stall facility. At Legacy USA, the team will prepare the stallion, Rubinero for global competition, which could include the 2015 Pam American Games in Toronto, Canada. Dream Street Stallions, in conjunction with Equine Imports, LLC owned by Bernardo, import the most desirable sport horse bloodlines from Europe and offer breeding, sales, dressage training and stallion campaigning services. Dream Street Stallions is one of the few programs that offer dressage lessons on quality FEI/Grand Prix school masters. An Open House is scheduled at the Legacy USA Equestrian Center from 1:00 – 4:00 PM on Sunday, June 22, 2014 to honor the arrival of Chicago’s newest equestrian celebrities. The gala event will include a special presentation of the black stallion Rubinero with Rick Rockefeller-Silvia. The stable is located at 16 W 325 91st Street, Burr Ridge, IL 60527, about 30 minutes from Chicago and only one minute off of I55. Dream Street Stallions is currently standing the impressive stallions, Rubinero and Deperado. Desperado is by Dream of Glory, Germany's 1999 best Young Stallions dressage sire and PSI Auktionen Stallion of the Year, and his grandsire, Donnerhall, is known as “the most successful dressage horse in the world.” The 11 year old, 17.1 hand Austrian warmblood stallion is the former mount of German Olympic Dressage Medalist Isabel Werth. For more information about Dream Street Stallions, visit the website atwww.dreamstreetstallions.com or call 561-758-0528 or visitwww.LegacyUSAstables.com 630-325-4230. These photos may only be used in relation to this release.